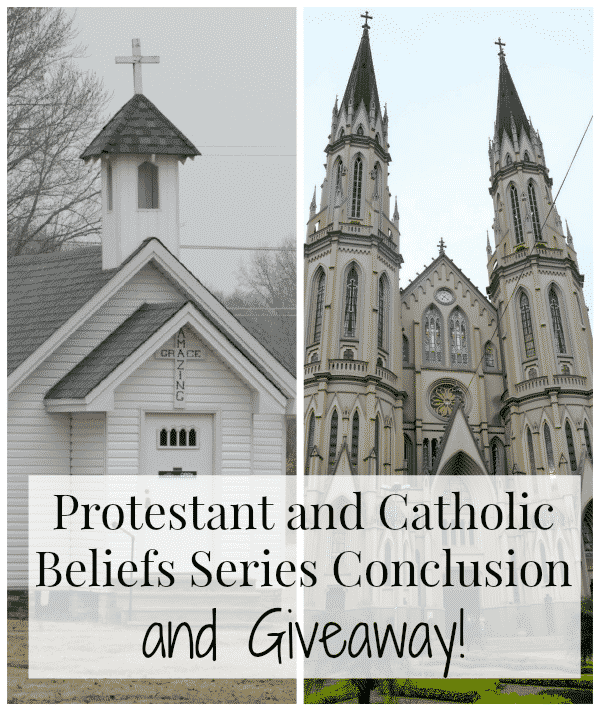 Protestant and Catholic Beliefs Series Conclusion and Giveaway! 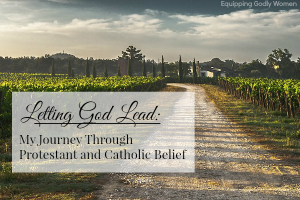 This post is the conclusion post to a series entitled Letting God Lead: My Journey Through Protestant and Catholic Beliefs. If you are new to this site or this series, I HIGHLY encourage you to check out the rest of the series as well. *This post contains affiliate links. A little over a year ago, I began a journey–a journey to find out the truth behind Protestant and Catholic beliefs–and what a journey it has been! We covered a LOT of ground in this series, and I hope it’s true to say that we all learned a lot. In the series introduction, I shared my story: How I grew up (and still am!) a very dedicated, Bible-believing Christian, and how I got started on this journey in the first place. Next, I did my best to dispel 10 Common Catholic Myths in the hopes that everyone following along would be able to do so with an open and informed mind. We discussed the Eucharist, and I presented solid evidence concerning whether or not it is the true Body and Blood. We discussed “Sola Fide” and whether faith alone is enough or if we need something more. We discussed “Sola Scriptura,” talking about important issues such as tradition and the authority of the church, the Bible and the first century apostles. We discussed the history of the Catholic church and evidence for/against the Apocrypha. I offered some insights on what Catholics really believe about the Pope, priests and confession and why. And then I did the same thing with the issues of Mary, Saints and Statues. We took a look at Biblical and historical evidence for/against Infant Baptism. As well as Biblical and historical evidence for/against Purgatory and Indulgences. And then last week, we capped off the series with a lighter topic: Why do Catholics do all the weird stuff they do? Of course there will always be more to say and more to cover, but hopefully this series has been enough to get you thinking and researching for yourself, instead of simply blindly believing what you’ve been taught from birth. Because when I examined what I’d always been taught, I found out a lot of it was wrong. My teachers were wonderful people, but so many of the principles they taught me simply were not Biblical. I don’t want you to make the same mistake. Whether you are Protestant or Catholic–honestly, I could care less. Maybe I should? But it really doesn’t matter to me. What matters to me is that you have researched the issues yourself, that you know what and why you believe, and that you can confidently defend your beliefs to others. That you believe on purpose because you really know it to be true–not that you believe by default because someone told you something and you didn’t bother to fact check for yourself. So now, for the moment you’ve all been waiting for–what did I decide??? 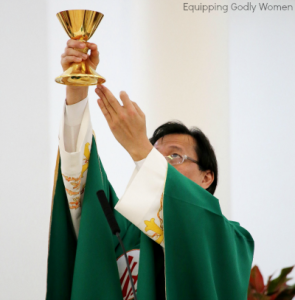 Is the Eucharist the Real Body and Blood? Yes, I believe it is. Is Faith Alone Enough? No, I believe God expects something more. To be very clear: Both Protestants and Catholics agree that you cannot earn your way into Heaven through works. We are saved because of God’s grace, which allows us to have faith. But in light of the verses I shared in my Is Faith Alone post as well as the following two arguments, I have to agree that yes, you do need faith, but that you can’t just stop there. Once you are already “saved” (or “justified”), your life needs to reflect that. I think, deep down, many Protestants would agree. You can’t just say a prayer and then go on your merry way. Argument #1: Protestants say that nothing we DO can get us to Heaven. Yet, the very act of choosing to believe is a verb–something we DO. God doesn’t force us to be Christians against our free will. We choose it. So we can’t reject ALL works, because believing is a work itself. Argument #2: If simply believing were enough–well, even satan and his demons know that Jesus is God. They know He is the only way to Heaven. If all you had to do was believe–wouldn’t that make satan a Christian? Yet, I’m pretty sure we would all agree that’s preposterous. Why? Because he certainly doesn’t act like a Christian! He doesn’t repent, or submit or act like a Christian–all things Christians DO. So simply believing in Jesus can’t be enough. So in light of alllll of the verses I listed in my Is Faith Alone Enough? post (check them out!) combined with the two arguments above, I can only conclude that we HAVE to play a role somehow. Faith alone is not enough. I have NO IDEA where that line is–concerning what we have to do, how much we have to do, etc, but I have to believe that something more is required. Who has the Ultimate Authority–the Bible or the Church? The Church… I think? But which one?? Based on the findings I shared in Who Has the Ultimate Authority? A Biblical Look at Sola Scriptura, I strongly believe that the Bible was never meant to be a comprehensive how-to guide that covers every topic. It IS infallible on the issues it covers, but it doesn’t cover everything, and it leaves a lot of things open to (mis)interpretation. So, while I am definitely very much a Bible-believing Christian, I have to agree that we need more than just the Bible; we need the rest of the teachings and history–which we *should* find in the church. However, while I totally understand and support the need for and appropriateness of having the church be our authority (under Christ of course! ), I did not see any evidence that points to the *Catholic* church having to be that authority, instead of the church in general. Catholics believe that the Catholic Church we have today is the same church the Christian churches had in the first century, but is it? How do we know they didn’t get off 5 degrees somewhere and end up way off course today? How do we know they clung to the right things? The pharisees thought they were experts at keeping the law, but they got in big trouble when Jesus came to town. I mean this in a polite and sincere way, but how do we know the Catholic Church hasn’t done the same thing? This has been my main nagging doubt this entire time, and it has yet to be resolved. Is the Apocrypha Scripture? Don’t ask me; I have no idea. 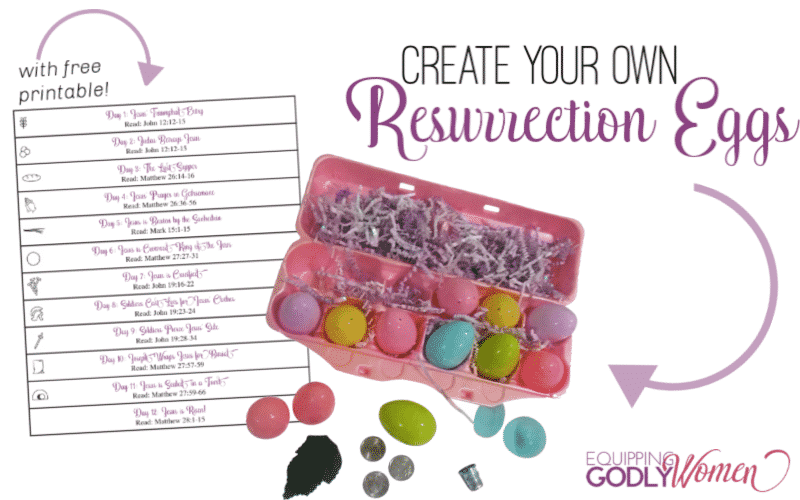 Did you see the chart at the end of my History of Christianity post?? All of the information is hopelessly contradictory!! And while I can throw out several of the arguments on one side or the other (the books were found with the Dead Sea Scrolls–we checked! ), I still see very logical points on both sides. So quite honestly, I have no idea. I am ever so slightly leaning towards the Catholic perspective since they were in the Bible for hundreds of years before Martin Luther took them out, but I could easily go either way. I simply don’t know at this point. I don’t have a problem with the pope being infallible (I don’t know if he IS; I do believe it is possible). I’ve always liked the idea of confession and thought it was a good practice. I do believe priests could have the power to forgive sins. It does seem a little unnecessary to me, but that’s probably just my upbringing. I don’t have any theological problems with any of it. Logically, it makes a lot of sense. 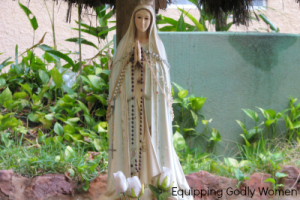 I do NOT believe Catholics worship Mary, saints or statues. (Well, maybe some do in other countries, but your average American Catholic–no.) I personally think some Catholics pay them more attention than they maybe ought, but then again, you’re going to have people mess things up in any religion. Mary: In all honesty, I simply don’t “get” all the hubbub about Mary. Yes, she said yes to God, but people say yes to God every day. Even if she is the most important human in history (and I don’t have a problem with that)–she’s still human. Even if she were sinless (and I don’t have a problem with that either)–it was because God preserved her from it, not because she did anything herself to deserve it any more than the rest of us. I understand that Mary is supposed to point us to Jesus, but I can’t help but feeling that, for some people, all the Mary stuff has become a distraction. Saints: I don’t know if I feel particularly compelled to pray to any Saints, but I don’t necessarily have a problem with the practice **when done according to official Catholic doctrine. ** I don’t think it’s really necessary, but I don’t think it’s sinful, either. Statues: As long as Protestants have nativity scenes, they can’t point fingers at Catholics because it’s the exact same thing. I have zero problem with statues (when used appropriately). Is Infant Baptism Scriptural? I’d personally rather not wait. I don’t know that Scripture is incredibly clear either way, and I say this because I can easily make good, Scriptural arguments for either side. Plus, when you look at early Church history, they did it both ways. BUT since it can’t hurt and it can potentially offer many huge benefits, according to Catholics–why wait? We baptize our babies as infants. I decided I wasn’t ready to become Catholic at this point. We attended all of the learning type classes and then dropped out before the rites. We still attend Mass every Sunday. The reason I chose to drop out is because when I looked up what the rites of sending and election are (the “ceremonies” we would go to next), I read that I would be asked “Do you believe all that the Catholic church teaches to be true?” And my sponsor (my husband) would have to vouch for me. Well, I can’t in good faith go up in front of an entire church and declare that I believe everything the Catholic Church teaches is true. I’m not saying it’s not. I’m saying: I don’t know. I still have questions. I’m still learning. I’m still seeking. I haven’t read the entire Catechism yet. I haven’t read all of the Apocrypha yet. How can I state I believe they are true if I don’t know what is in them? At this point, I can’t. I’ve changed my mind on a LOT of really important things–the Eucharist, confession, praying to the saints… I’ve learned a lot and I’ve come a long ways. But God isn’t finished with me yet. So now… I continue my journey. And you begin your own. And The Catholic Company has an amazing offer to help you do just that! 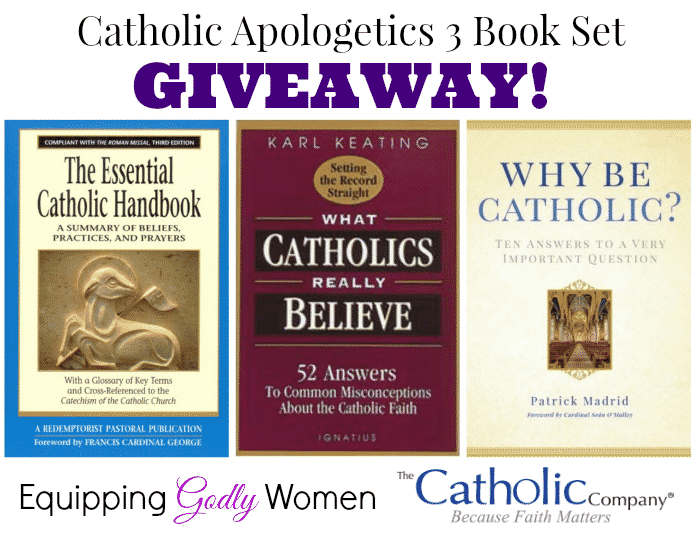 The Catholic Company has graciously offered to send three books to one lucky winner! I picked out all three of these books myself because they all look FANTASTIC. If you’ve enjoyed this series, I know you’ll love these books as well. So the series is done for now, but that doesn’t mean our journey has to be over. Go back and read through the posts again, really mulling over the points. Get and read the books above. Talk to your priest or pastor. Talk to me; I’d love to hear from you!! Don’t let your journey stop here. Here’s a list of topics we’ve covered so far, in case you still need to go back and catch any you missed. So that’s an update on me–how are you doing? What questions are you still wrestling with, if any? Let’s discuss! I have loved this series and will be following along from now on. Thank you for your honesty, your hard work and dedication, you have forced me to start my journey again and I really feel as though I have te resources to make the right decisions. I really enjoyed your open-minded series and appreciate how you were able to present information objectively and at the same time share your honest feelings about what you were discovering. After moving from a predominantly Catholic northeast community to the south 8 years ago, I learned that as Christians, Catholics and Protestants are alike in more ways than we are different. We all share the basic belief that God sent His son to save us and it is up to us to accept Him as our savior. As a Catholic I am grateful to you for helping to clear up a lot of the misconceptions about what we believe and practice. It is always hurtful to me when I hear someone say something that hints that Catholics are not Christians. (A very young co-worker once said to me “I used to be Catholic, but now I’m Christian.” grrrrrrrrr……….) Even though I am a life long Catholic, I learned so much from your posts! (though I’m still trying to figure out that Indulgence stuff) Please continue your posts as you proceed in your journey! Thanks, Maria! Thankfully I’ve never heard much of the worst myths etc in real life myself, but after doing all this research, now I know it’s out there. So sad. We really are a lot alike. I hope through this series everyone is learning and questioning in order to grow, not in order to be divisive. And I’m happy to post updates, but who knows when those will be?? I do hope to start a new series this summer, though, so that will be exciting! I have enjoyed this series. Thank you all the time you put into it and your honesty. God Bless you on your journey. I found your site here, and thus realized the incredible journey you have been on, quite late in the game. That said, I can’t tell you how admirable I find it, for someone to put so much time, thought, heart-reflection, and all around honest-effort, into seeking and finding the TRUTH. I do happen to believe you would find it in one I believe to be the ‘one true church’. But of course, that would be for you to discover, and it is my prayer that in time, you do. I hope to find time to read more of your journey. Thanks for listing your milestones, as you have. I have really enjoyed you series and have learned some things I never knew. I pray for you on your journey and for your husband to have patience while you continue to discover. I really hope you someday join the only church Jesus started and continues to watch over today. Enjoy your journey and discovery and remember, His Plan, His Way, His Time. I grew up catholic and went to catholic school. I left and have been going to different churches. Recently, because of geography, I sent my daughter to a catholic preschool. I’ve started going back to the church and we are going to send our kids to catholic school next year. I really appreciate this series. It’s has helped me understand a lot of what I forgot from way back when and figure it all out in my head. Thank you so much! You are so welcome! Thanks for joining us! Thank you for a great blog series. I followed you the whole way! I have referred to your posts in talking with my Protestant friends. I was in your place at one time. I remember being where you are now and sitting there with my doubts (small but real) and not sure where to go from there. Then it dawned on me, at some point, as I continue to think that MY rational deductions were going to change anything, that I was continuing to “protest”. I could not have it both ways, I was either Protestant (and I had come TOO far for that) or Catholic (sorry, not arguing Orthodox here). It was a moment when I had to say, is this a place to step out in faith? Like I did when I first accepted Jesus but did not have all the answers either? I decided it was. I had to trust that the HS was with the Church from its beginnings and I was going to trust the Holy Spirit in the Church not MAN (in the church). It was an instant relief and I have not looked back since. And honestly, when I made that conscience decision, over time all my doubts began to makes sense. Now I see those doctrines I struggled with as making perfect sense. But I feel like God was asking me to STOP analyzing and begin trusting. Praying as you continue on your journey! I hope to get to that point soon as well. Right now it is all head knowledge, not heart knowledge/faith, but I want to make sure that when I do put my faith in something, I am trusting in a firm foundation. I enjoyed your series so very much! For the sake of clarity, I would like to point out that Mary deserves so much respect, in part, because of the circumstances surrounding her immediate leap of faith when she answered “Behold, I am the handmaid of the Lord, let it be done unto me according to your word”. She was probably 14-15 years old, engaged to be married and according to the law, a pregnancy not by her betrothed was a crime punishable by death by stoning by her whole village, including everyone she had ever known! I know that I, as a grandmother, probably STILL lack that degree of courage and at that age I would probably would have just laughed at Gabriel! That alone makes her at least a superhero! Also, the candles that we favor so much are a vivid reminder that Christ is THE “Light for the World”. As a grandchild of a Southern Baptist missionary, my journey stretched completely away from any church. For many years I rejected all ‘formal’ religion and set not a foot in a church.I talked AT God all along but I didn’t KNOW Him. After losing two babies, He granted me my deepest desire, and gave me a miracle pregnancy. It was only then, in my thirties and on strict bed rest, that I decided it was time I discovered just who He was. I read every book in the big city library, on religion in any form. For almost six months I laid there and started the most important relationship of my life. I learned what a covenant relationship was and, for the first time, discovered the gentle yet all powerful, lover of my soul. After a lifetime of begging this unknown entity to kill me, I finally realized that St Augustine (I think it was) was correct in that ‘our soul will be forever restless until it rests in Him who created it’. It took a couple of years to make my way home to Catholicism and several more to fully embrace Mother Church and ALL her teachings. For me, I finally found understanding (after 3 years of RCIA classes) when I just poured out to God, all my misgivings, all my doubts and all my fears and asked Him to make me understand. Quite suddenly, I just did. It was one of the best days of my life and I can still see, a decade later, how He led me home, one faltering, wobbly step at a time. I pray that you allow Him to lead you where He will so that your faith becomes as abiding and sustaining as my own has been. It changed every aspect of my life. My heart was as barren as a lunar landscape until I REALLY gave it to Him and He made it as fertile and lush as any tropical rainforest! I had never before realized that He IS LITERALLY “The WAY, The TRUTH and The LIFE”. Enjoy your journey! Thanks! And yes, that was very courageous of her, but according to Catholics she didn’t have original sin either, so… Was she really going to not agree with God’s will? Hi Brittany–again a post to an old thread, but I wanted to point out that Adam and Eve didn’t have original sin either when God created them. But they had free will. This really helped me in trying to understand the role of Mary. 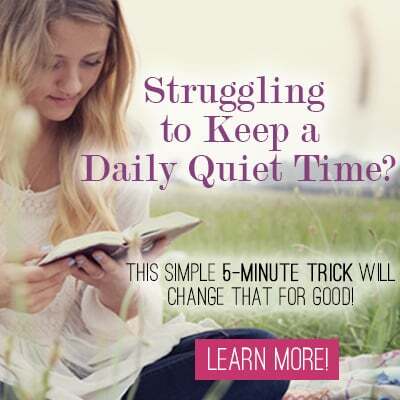 I’m not saying I have it all figured out–but it helped! I’ve been following this blog series and I have to say it makes me really sad to know you didn’t convert. I respect your decision, but at the same time, it upsets me knowing that the only thing that is stopping you is not knowing 100% on certain things. I am sorry to say but you will never know 100%. As Christians, we all truly don’t know Jesus Christ is real and he can easily fix that by appearing in front of us, but he doesn’t because he gives us, FAITH. And that’s what you need if you are leaning more on the feeling the Catholic Church is the One True Church Jesus started. I highly advise you to speak to Scott Hahn, Steve Ray, Tim Staples, and/or Jimmy Akin about your doubts. Hear what they have to say especially on how do we know if the Catholic Church didn’t mess up somewhere along the way. I think if it did, there would be 30,000+ versions of it. It truly makes me sad knowing you are not going to be received into the Church this year but at the same time, I rather you not convert than convert and doubt the religion. I wish you the best of luck in your journey and God bless you and your family. I am not coming back here as I know you will never enter the Church because theres no way to know for sure – about anything, not even the other Protestants Churches. So if you can’t prove any of these Churches is right, are you just going to not pick one ever? I’m not expecting to be 100% certain, but I do still have some big questions. It’s like buying a car–you don’t just go to the dealer and buy the one the first salesman tries to sell you, even if he says it’s awesome. You ask lots of questions. And what would you do if every time you asked a question, you got a ton of conflicting answers? You’d probably be really skeptical and research more. That’s all I’m doing. Lots of conflicting information–trying to figure out which source to trust. And there ARE 30,000 Protestant denominations. The question is just: Is Catholicism the one true one and then there are 30,000 errors? Or is Catholicism one of 30,001 variations of Christianity to choose from? I’d say that’s a pretty important question. And one I’m still researching. Not for 100% certainty, but enough to know I’m not trusting someone who has it all wrong. When Thomas doubted didn’t Jesus show him His palms? And don’t we have to be able to give an answer for the hope that we have? I know there is a time to step out in faith but the Holy Spirit will let you know when that is. I admire your logic, research and search for Truth. You are helping me so much. It is nice to know I am not the only one who is going through this questioning. Thank you for your encouragement and hope. Yep. I know it is supposed to be “better” to just believe based on faith. But personally, I need to have some logical evidence that what I am about to put my belief in is true before I do. Because after all, it isn’t like Jesus himself showed up on my doorstep and said “Hey, Brittany, here’s a phone book. I circled a few churches I’d recommend.” At this point I’m really having to take other peoples’ word for it and hope that they didn’t mess up too many things in translation. Brittany, I wanted to congratulate you one last time on your well-written series. It has been a pleasure to get to read your posts on Catholicism and discuss them in the comments section with so many brilliant people. I also commend you on your integrity in not wanting to say you believe all that the Catholic Church teaches when you aren’t sure. I know that people like me urged you to stay Protestant and others urged you to become Catholic. In the face of suggestions from both sides, it is all the more commendable that you said you don’t know for now. I simply hope that whatever conclusions you eventually adopt (whether Catholic, Protestant or Orthodox) will contribute to your relationship with Christ and that you and yours will continue to grow spiritually and prosper in the meantime. I plan to make a couple of more comments later, but, in the meantime, I also wanted to thank those who have dialogued with me in the comments section of this site. I came across this series because a friend mentioned it on social media, and since then, I have been helped spiritually by getting to examine my own beliefs as I dialogued with others. I hope that we may all meet someday in heaven, united in Christ. I’m betting we will! After all, most of us believe almost the same thing and try to live the same ways–it’s all just in the little details and semantics. Thank you so much for all that you have contributed to the conversation! I truly appreciate it!! I’ve been following your journey with great interest and was really hoping you would take that leap of faith and come home. In fact, I was really surprised you didn’t. Yes, there are a few things in Catholic doctrine that are hard to accept, I’ve been there myself, but I have to say that in the end it’s really not little details and semantics, not at all. And the dealbreaker really is the Bread of Life. If you believe Christ is really present in the Eucharist, just like He told us, then you have to accept everything else He said about it. If He told us you have to eat His flesh and drink His blood to have eternal life, and we believe what He said is true, how can we possibly let even one more minute pass without doing anything and everything we have to do to receive Him? I just don’t get it. Yes, that is a very important detail, but that doesn’t mean that everything else is just a minor detail. Just because the first century Christians believed in the real body and blood doesn’t mean that Catholics today got everything right because they agree on that one important topic. I’m not saying they are right or wrong–simply that I don’t yet have enough information at this point to feel very certain one way or the other. What I’m trying to say is that it trumps everything else. Even if there were some minor things the Catholic Church got wrong (just for the sake of discussion, I’m in no way conceding the point) it still wouldn’t matter because it is the only one that gives you what is required for your salvation, the Body, Blood, Soul and Divinity of Our Lord Jesus Christ, present in the Most Holy Sacrament of the Altar. Do you really need anything else? As a counter-argument only–what if I created a new religion that claimed that Eucharist is the real body and blood, but also sacrificed goats to the sun god too? I’d have to argue that while the Eucharist might be (is) super duper important, it isn’t the ONLY detail that matters. It’s been so great to follow your series and as a cradle Catholic (who embraces, practices and loves the Catholic faith) I have learned so much from your posts! There are still beliefs of the Catholic Church that are difficult for me to understand due to our human limitations, but my take on it all is that if we say that the Catholic Church is the one true Church started by Christ, then she can’t be right on some things and wrong on others. Christ and His Church can never contradict itself. Men can fail and do, but Christ’s Church is preserved by the Holy Spirit and can never be in error. So it takes faith and never ending search for wisdom and truth to be a Catholic. I will continue to pray for your journey “home” as the Holy Spirit guides you in His timing. Have a blessed Triduum and I hope you will be able to attend a Catholic Church sometime during these most holy 3 days of the liturgical year! I’m glad you enjoyed the series and thanks so much for all of your help in promoting it so more people could find it!! I really appreciate it! I have loved this series! As a girl, I went to mass with my grandmother often. I do miss mass, and I think that I am essentially Catholic in beliefs, but my husband and I attend a Methodist church (which is the denomination I was raised in). My husband attended a non-denominational church as a child, so Catholic is very foreign and uncomfortable to him. It is important to me that the whole family attends church together, so I haven’t tried to convert (yet), but I do often feel pulled to the Catholic church. I have really enjoyed your series and will come back to read the next one you’re talking about (I’m not a wife and a mom yet so most of your other posts don’t really apply to me yet). There was a time when I had a crisis of faith, but I was able to find very believable and logical explanations in the Catholic church for what I didn’t understand or for those things that seemed weird to me. It’s a good thing that you’re taking this seriously, I hope you will continue with this path and eventually find the Truth. There is no way he was talking about the church as a whole, because Christians have fell apart into so many denominations that often don’t have much in common. Yes, they all see Jesus as their savior, but they differ on VERY important things to the point where some denominations have more in common with Buddhism then with other Christians. Also, Catholic church stayed the same through centuries. Sure, there were some very dark times (like the Crusades and inquisition) but the Chruch always “recovered” and came back to the right path. Those who decided to divide from the Catholic church without exeption ended up falling apart into more and more smaller denominations. I’m a Catholic and in all honesty I have to say we’re for sure not better people than an average Protestant or a Mormon or another non-denominational Christian. Catholic church didn’t stay unified and stable in it’s beliefs (that were, and are, often critisized and unpopular) because we’re so awesome and great and better then everyone else – it simply HAS to be God’s intervention. It’s logical to assume that maybe He was talking about a different denomination. But which one? Which church other the Catholic church kept the same major beliefs (like the Eucharist) and didn’t have a man interfere with God’s word? Protestants had Luther, Mormons had Joseph Smith…they all had something to add to what Christ said and did. It does, and that’s my question exactly–“which one is correct?” Not that I feel particularly compelled to choose a label (I’ve never taken one other than simply “Christian”), but I’d like my beliefs to be as close as possible to the truth! Brittany, don’t give up on your searching. I pray for you. Blessings! That is a great quote! I’ve never heard it before. Funny! I will continue reading, researching, searching and praying! Thanks for your well wishes. Thank you for your series. It was a great read over Lent. I am a Catholic convert, many years ago. I am still learning about the church. In many things I will never understand 100%, that is the mystery of faith. God bless you and your family as you continue your journey. Thanks, Kerry. I’m glad you enjoyed it! Bravo Bravo Bravo !!! I totally admire you for not entering into the Church when you were not sure you could say you believed in some parts of t the Catholic faith you had been learning about. Oh.. it cut off the rest of my post. the first is Jenny fulweiler Something Other than God. I figured “Rome Sweet Home” was one of them. I’ve read it (It’s been recommended to me so many times I had to!!) It wasn’t “fluffy” per se, but it was definitely mostly their story, not a laying out of key points point by point. Great read though! I’ll have to look into the other one too. For reading material, the ‘Surprised by Truth’ books were actually a great help to me. They have the stories, but each one seemed to have a piece of truth that was dealt with in a Biblical and logical manner. I ended up converting last Easter. During RCIA I managed to read the entire Catechism, and it’s easily the most amazing book of the faith I’ve ever read. This after 40 years of staunch Protestantism including a couple of years of evangelical Bible college. The Coming Home Network also has a ‘newsletter’ dealing with Mary which was also a great help to me. Thanks for such honest and informative writing, and prayers that you draw closer each day to Jesus no matter where He plants you! I’m glad you found the books so helpful! I thought they were very silly, but that’s probably just a matter of personal preference 🙂 They were definitely influential!! I have enjoyed your series. It reminds me a lot of my wife’s journey to the Catholic faith. She was raised Primitive Baptist, which is almost as far removed from the Catholic Church as you can get. My wife had attended mass with me for three or four years before she decided to take RCIA. It was a wonderful program taught by a wonderful priest, Fr. Marvin LeFrois, in Valdosta, GA. She decided not to enter the church during the Easter Vigil that year. She did come into the Church later that year, during the Advent Season. It was wonderful. We were also soon blessed with the news that we were expecting our first child. Twenty years later, we have three faith-filled children and are very active members of the Church, and are still on our journey. Blessings to you as you continue your journey. My prayers go with you. I’m presently on the exact same journey and I’ve reached similar conclusions, though I have yet to attend a mass or reveal anything publicly. This is going to be a bombshell in my community of friends and family, so I want to make absolutely certain of my decision before igniting that fuze. I can imagine! Hopefully this series has given you a lot of really good information you can use to answer any of their questions. (Or you could always point them this way!) Good luck! While I’ve come to the conclusion Protestantism has many, many problems (which you’ve hilighted quite well), I’m finding Catholicsm has some issues too. For me the biggest is the changing of key doctrines through the years, which is something the EOC does not do. Very interesting path we’re on… If only being human were easy. 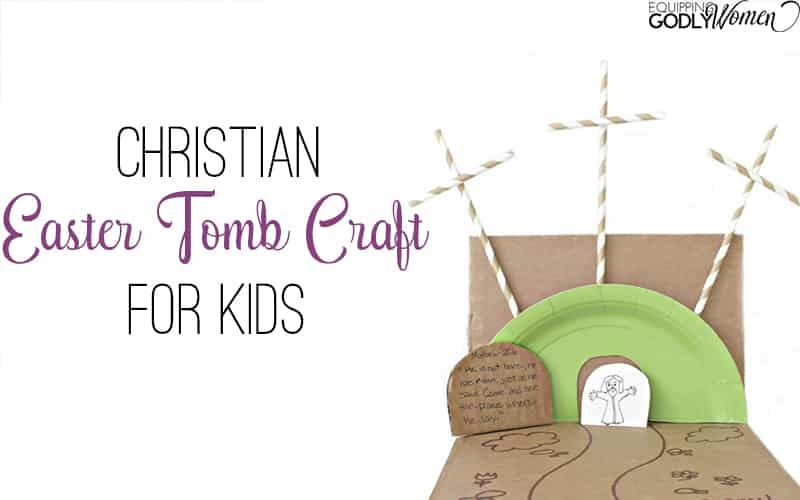 Yes, Orthodoxy is on my list to check out! But key doctrines like what? Catholics differentiate between “Big T Traditions” –core doctrines handed down from the apostles and “little t traditions” –things they do just because they can. Big T Traditions cannot change, little t traditions can. And also, things aren’t always law until they are defined. The first century Christians believed a wide variety of things, being taught by different apostles, until the Church made formal rulings and creeds here and there. Oops, yep! That’s exactly what I meant! I’ll fix that in case someone comes across it later. Hi Chad – I hope this comment reaches you somehow – I’d be keen to get in contact and hear more of your opinions about the RCC vs. the EOC. Coming from a Protestant background. I was wise enough (or foolish enough) to find a Catholic girlfriend. I’m now exploring the quagmire which is church history and all the competing arguments for church authority – and trying to make a decision which isn’t intellectually dishonest. Brittany, all of us admire and respect your journey of faith. Think about the two disciples on the road to Emmaus, or Paul on his way to Damascus, or the Ethiopian before Philip taught him. You’re doing your work and can rest assured that Jesus himself, or an apostle, will lead you to the fullness of truth. As an “all-the-way” Catholic, I think the “cafeteria” approach of believing some things but not all is not good for the Church, or the Christian. I believe that God will use your journey to great effect on others, as he has Scott Hahn, or Steve Ray, or Tim Staples, and others. I challenge you to apply your considerable intellectual skill to pondering “ecclesiology”- what is the Church? You already agreed that Jesus gave the Church authority (part 5). But is the Church an institution, or something more? And if the Eucharist IS JESUS, as you say, can you deny yourself His intimacy for a few lingering doubts over dogmatic details? 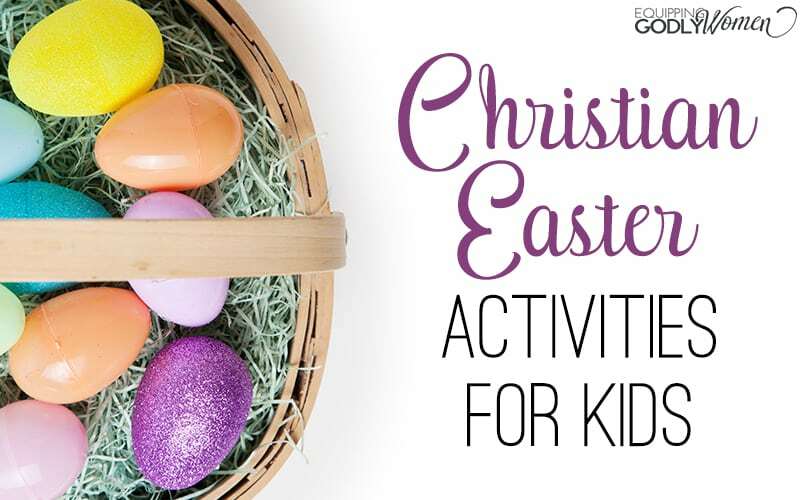 Have a joyful Easter, and know that we all love and pray for you as a faithful sister in Christ! Thank you for this beautifully written series. I admire how much you researched on this subject. I don’t know that I agree with all your conclusions, but that’s okay, you don’t need me to agree with you! I expect there will be a LOT of disagreement in this series! But as long as everyone is learning more and keeping it friendly–that’s all that matters to me! Glad to hear you’re learning and growing! That’s exactly where we all need to be! I was raised Roman Catholic. Baptized, First Holy Communion and Confirmation all Roman Catholic. Attend Catholic school for junior high and loved it. My children are all baptized Roman Catholic. My oldest (he’s 28) is just now exploring faith. My other son (25) and daughter (19) are both Presbyterian, Reformed. My husband is Lutheran. Lutheran is a lot like Catholicism. My husband and I had been attending an evangelical Christian church. I attend an evangelical southern baptist college (online). To me it seems all the same. We all believe in one God. We know that Jesus died on the cross for our sins. Doesn’t matter what you call it. A Christian is a Christian. And that’s all that should matter. It’s “religion” that gets in the way of faith. Lose the labels (and I say that with all love). We’re all believers. And we know why we follow Christ. The word Apologetics caught my eye because I am currently taking an apologetics class as part of my major. I am really enjoying it. It has sparked a lot of things to mull over. Yes! The point of this series was/is not to highlight our differences in a divisive way, but just to explore the topics so we can all learn, grow and figure out what and why we believe. I love apologetics too–so interesting! Linda, I’d be a little careful about saying that “religion” gets in the way of faith: religion is the outward expression of and participation in what we profess to believe. Moreover, consider that a Church with a religion gave us the Canon of Scripture; furthermore, even those who claim to pit Jesus against religion and disdain religion forget that such a practice is itself a religion– a religion that claims to do what it likes for believing whatever it wants, and also apart from what the earliest Christians believed. None of the Early Church Fathers, themselves disciples and successors of the Apostles, for example, saw Scripture as the ultimate authority like Martin Luther did and many to most American Protestants do. If we claim that it is, what makes us right and them wrong? But Unitarians, from what I remember, don’t believe in the Trinity. So what do we mean by “one God”? The Catholic Church teaches the following about the Trinity– Three Divine Persons, One Divine Substance, as opposed to God as one person. As per the Nicene Creed, Father and Son are consubstantial in the unity of the Holy Spirit. Also not every Christian believes in the Real Presence as per St. John’s Gospel. Many Protestants view the Eucharist as a symbol. Catholics do not: Catholics understand that first-century Jews were scandalized when Christ said “unless you eat My Flesh and drink My Blood, you shall have no life in you,” and left. He let them go, asking his disciples if they wished to leave, also. So we do believe different things, all of which have logical consequences, and Catholic belief in the Eucharist is distinct. Lutherans believes in the Real Presence, too, but consubstantiation is not the same as transubstantiation: it matters whether you believe that Jesus is present in the bread and wine, or whether you believe that bread and wine are actually changed, in substance, into the Body and Blood of Christ, even if they still look like and taste like bread and wine. Historically, you also can’t deny the Holy Trinity and claim to be a Christian, regardless of what you want to call yourself: Christian belief isn’t simply what we decide to call ourselves based on our loving and following Jesus– it is the belief of the Church going all the way back to the Apostles. So when we say things like that, what makes us right and the historical Christian faith wrong? Do we claim to have more authority than the Council of Nicaea to decide what Christian belief is and isn’t? If we don’t trust the Early Church, isn’t that saying that we don’t trust Jesus and the Apostles? And what do we even mean by “Jesus”? We all– from Bill O’Reilly to Deepak Chopra to Oprah– claim or assume to know, given how domesticated Jesus is in our culture. But it actually matters whether or not we believe that Jesus Christ is fully God, fully man, because only a Jesus who is also God and not merely human can lay down His life of His own accord and rise from the dead– and if Christ did not rise from the dead, our faith is in vain. What we believe about Who Jesus is also says something about how He saves us and the manner in which He chooses to do so. So okay, Jesus died on the Cross for our sins– but it matters whether we believe Jesus is God or not: because either God died on the Cross to take away our sins, or He didn’t. If God chose to suffer for us, then He also knows what it’s like for us to suffer, having taken human nature unto Himself. So He’s either intimately close to us when we suffer, or He isn’t. What an amazing series…I am not quite through reading it…I admit I am slow 🙂 I am a Protestant, married to a cradle Catholic turned Protestant. To tell you the truth we are still searching for truth and I pray we will never stop. This series has challenged me to look at Christianity as a whole not fragmented and give real time to prayer while wading through these important issues. I am thankful that you took this challenge upon yourself as you have blessed so many people along the way! Thanks for such a great series! My husband and I just joined the Church a year ago, and basically had all the same questions you do 🙂 What finally answered our question about the authority of the Catholic Church is Jesus promise that not even the gates of hell would prevail against the church (Matthew 16:18) and that whatever Peter “binds on earth will be bound in heaven.” Once we studied more about the succession of popes and they can trace the line all the way back to St.Peter, we were sold. If Jesus promised to protect the Church from error, then we had to believe him and take him at his word. Thanks a big point for me too, except–how do we know the church being referenced is the *Catholic* church, not a different denomination or just the Christian church as a whole? I’ve been enjoying your posts, Brittany. I think you’re where you need to be at the moment, in that I can understand why you can’t, in good conscience, commit until you’ve thought things through. I don’t claim to have a definitive answer to your questions, so this, if anything, is a sketch of where an answer likely lies. The biggest stumbling block that you seem to wrestle with right now is authority, whereby your “the Church or Scripture?” question and your question about the Deuterocanon are actually related. But if you don’t know whether the Church or Scripture has ultimate authority, can you really ask the last two questions about whether infant Baptism and Purgatory are “Scriptural”? I’m a little confused, because you admit that Scripture is not self-interpreting in your admission that having the Pope makes sense. But by asking those questions about Baptism and Purgatory, you’re implying that Scripture has ultimate authority, which is your fall-back position from your Protestant upbringing– a question that, by your own admission, you’ve yet to answer and still struggle with. Moreover, I’ve read some of your older posts about where the Bible comes from, and you note that the Bible is the gift of the Church, not the head of the Church– but yet, the Church isn’t something nebulous; the Church is the Body of Christ. Christ is the Head of the Church, and the Church is His Body. But Christ is Someone specific, and He builds His Church in a specific way: the authority to bind and loose pertains to Who Christ is and isn’t. When Christ asks, “who do they say that I am?” The Apostle who answers that question correctly is St. Peter– and He knows the answer not by way of what flesh and blood could’ve told him, but by way of the Father in Heaven. That is the special charism of the Pope and comes with the office– for example, Pope Francis now has that charism; Pope Benedict XVI relinquished it upon his resignation (once he’s no longer Pope, he ain’t got that charism). And if you read Matthew 16:18 more carefully, Christ does not give the keys– and with them the authority to bind and loose– to “the church” as a loose collective. He gives them to someone in particular: St. Peter. In both the Old Testament and the New Testament, the chief steward of any house– the al ha bayyit– is given the keys of authority. Also, when God chooses someone for a specific purpose, He changes that person’s name: Abram to Abraham, Jacob to Israel, Simon to Peter, and Saul to Paul. The Church is not, and has never been, a democracy: she has always had a hierarchical structure. Jesus did not just have disciples; He chose Apostles, all of whom were the first bishops, themselves priests, and who chose and ordained their successors. The Apostles and their successors also recognized the authority of St. Peter: http://www.catholic.com/tracts/peters-primacy. Note that the Pope is the Vicar of Christ, and not the People’s Supreme Representative. In other words, the Church that gifts us with the Bible isn’t nebulous, loose, or invisible. She is visible, with particular characteristics. In addition, one does not pit the Holy Spirit, the Church, and Christ against each other, by virtue of who and what they are: the Holy Spirit is Christ’s Own Holy Spirit, Christ is the Head, and the Church is His Body. Pitting them against each other, as many Protestants seem to do when they say things like “forget the Church, follow Jesus,” or claim to have the Holy Spirit and yet can’t agree on Scriptural interpretation, is incoherent since Truth does not contradict Truth, and Christ would hardly be at war with Himself, now would He? Also, consider that the same Holy Spirit that changes bread and wine into the Body and Blood of Christ at Mass at the invocation of the priest standing in Persona Christi, is the same Holy Spirit Who protects the Church’s teaching from error. It’s why I have a bit of a problem with something you said earlier– “the Holy Spirit will lead us into all Truth, but it doesn’t mean that we’ll follow”: wouldn’t not following the Holy Spirit mean disobeying Christ? Also, how does one even belong to Christ’s Body without obeying the Holy Spirit? One might belong imperfectly, but fully? Moreover, Peter knowing Who Jesus is when the latter asks, “Who do *you* say that I am?” (after hearing answers like “Elijah” and “John the Baptist”) may seem like no big deal in our culture where Jesus is everywhere to the point that He’s domesticated, whereby “Everybody (supposedly) Knows” Who Jesus is. Except that the Early Church had to contend with heresies, many of which still abound today for being given new life. It actually does matter whether you believe that Jesus was fully human and fully divine or not, just as it matters whether you believe that the Father and Son are consubstantial in the unity of the Holy Spirit. For example, many Christians, Catholics included, profess the Nicene Creed, none of which one can deny if one, as per historical practice, claims to be a Christian– and yet, they will separate “nice” Jesus out from “nasty” Jehovah, which not only contradicts Christ in Scripture saying that “I and the Father are one,” but also the Creed. It also matters whether you believe that God can act through matter or not– if you don’t believe that God can act through matter, then you essentially deny the Incarnation, which you cannot deny, either, if you claim to be Christian. Good question! To ask whether the Catholic Church didn’t get off 5 degrees somewhere and end up way off course, you’d have to ask or pinpoint when that might’ve happened, and that date would have to be pretty early in order to dismiss today’s Catholic doctrines, which were practiced in the Early Church. I think that the answer to your question likely lies in Apostolic Succession and the Early Church: you’d have to show that the witness of the Apostles in the New Testament is different from the witness of the Apostolic Fathers of the Early Church. Moreover, when Christian doctrine is handed down, it isn’t passed down like a football– it develops organically, like when the times require further clarity. But it develops in continuity with what came before it. It doesn’t backflip. I think John Henry Cardinal Newman might well help you here, as would Mike Aquilina, “The Fathers of the Church,” and (though it’s perhaps a little dated) Karl Keating, “Catholicism and Fundamentalism.” Moreover, I’ve noticed that in your post on Church history, if I recall correctly, you don’t really engage with the Church Fathers in depth. Moreover, the issue of Apostolic Succession is also related to the authority of the Church when it comes to the interpretation of Scripture and also determining the Canon of Scripture, which is where the Deuterocanon comes in: in order to trust the Canon of Scripture, you have to believe that the Holy Spirit did not abandon the Church. In addition, some of the arguments brought up about the Deuterocanon, i.e. whether Christ referred to/quoted them or not, that you refer to seem to come from Brian Edwards’s defense of the Protestant Canon. But Joe Heschmeyer, in rebuttal, notices that Edwards applies a more relaxed standard for the books he accepts, and a far stricter standard for those he does not: http://catholicdefense.blogspot.com/2012/09/brian-edwards-in-continuing-my-search.html (see, specifically, the section on Jesus and the Apostles, whereas the supposed standard for including a book in the Bible is whether Jesus and the Apostles quote it directly– except that Edwards and those who make the same argument as he does fail to note that there are several books of the Old Testament that Jesus and the Apostles don’t quote directly, yet they are in the Protestant Bible nonetheless). The four marks of the True Church is that she is One, Holy, Catholic, and Apostolic, as per the teachings of the Early Church summed up in the Nicene Creed– and that she must have all of them. Fr. Dwight Longenecker explains it way better than I can: http://www.catholic.com/magazine/articles/how-do-we-know-its-the-true-church. I wrote about Purgatory and Infant Baptism in terms of being Scriptural, not because I believe Scripture is the ultimate authority (though I DO believe it is infallible), but because I realize that many, many of my readers are Protestants, who wouldn’t give much weight to church Tradition. So, I tried to include both–both historical evidence (such as what the common practice was way back when) as well as verses to give a more compelling argument or more points to ponder. “Also, how does one even belong to Christ’s Body without obeying the Holy Spirit?” — I don’t think that anyone is saying you should totally ditch one for the other. I was just trying to say that people don’t always get it right. They might think that they are following the Holy Spirit, or they might not even be listening on that particular instance and not realize it. You did a very thorough and good job with all your research! I was raised Catholic by default because when you live in South America, “everyone is catholic” (by default) unless you’re in a cult. My grandma was a very faithful catholic woman and I have no doubt that she was a praying, Bible believing individual. Coming to the U.S. and seeing 30,000 denominations (and more if you count Jehovah Witnesses and Mormons) – it can get soooo overwhelming! A lot of where I stand in my faith now as a Pentecostal Christian is based on me doing a lot of the same reading, asking questions, and reading some more until I found a suitable answer for me. All this to say, the body of Christ is huge and diverse and we all may be pleasantly surprised in heaven. Are there cult factions and deception in every denomination? Yup. Because we’re human. Which is why, like you said, we have to fact check our faith for ourselves. Quite regularly, actually. And I appreciate the effort you put into these series! Absolutely. I personally don’t really care which one people choose, as long as they are choosing it because they have really researched the issues and found it to be the closest to the truth. I don’t know that there is one church that has it 100% correct, but some are definitely closer than others!! Absolutely! Thanks for reading along! This is a fabulous post! Thank you so much. I have seen bits and pieces of it floating around on Pinterest. So glad I found the whole kit and caboodle. I can’t even begin to imagine all of the hard work you put into the research. You’ve presented everything so wonderfully. I think it’s wonderful you’re exploring and asking questions. In the wise words of Jennifer Fulwiler, “seek truth and question assumptions.” I will pray for you and your faith journey! Well, I’m glad you finally joined us! 🙂 Here’s the link to check out the rest of the posts in this series so you can see what you missed, if you’re interested! Wow girl you have covered a lot of ground with your series. So well written and presented that I’m sure this series will be frequented by those who are at the beginning stages of where you once were. Yes I did! And of course there will always be more, but we had to draw the line somewhere 🙂 And thanks! WOW, Brittany! What an amazing journey this has been for you. You are a great example of what it means to go out and find your OWN faith! It may be easy to accept and adopt whatever one was taught as a child, but it is NOT the most rewarding. Thank you for allowing us to join you on this journey. Keep seeking, friend. Hi Brittany, I am glad someone linked to your final post on Facebook. I read the first two, suscribed by email and never saw another one. Gmail has its own mind in sorting emails and I don’t like it. I look forward to catching up, and I am glad you are still asking and seeking. Open dialogue between denominations like this is so necessary. Yes, my newsletters generally wind up in the “promotions” tab. I’ve heard you can move them to the main tab by simply dragging one over though! And I will definitely check out that link. Thank you! Good to know! I’ll admit I know very little about Revelation. I also recommend Scott Hahn, Rome Sweet Home— I have to admit that I howled with laughter at the part where he said that he thought Revelation “just plain weird” until he brought his Bible to a Catholic Mass one day, and then things started to fall into place. I have loved this series and will be continuing to follow along. Sorry to see that you didn’t become Catholic yet. BOTH my husband & I are converts! God Bless you & may our Holy Spirit help you see the road Home clearly. Thank you so much for this series. I stumbled across it one day and I’ve found it really thought provoking and enlightening but at the same time I think you’ve been very balanced in your arguments. Thanks, Sarah! That was my intention all along–to get people thinking and questioning, without necessarily trying to take one side or the other. Hi Brittany. Although I only read the post on purgatory and indulgences (which I loved), I once again kind of accidentally landed on this post and like others, I was heavy hearted at the end. I totally understand and respect your wanting to be sure and hope you don’t mind my two cents, which of course I hope are God’s through me. This is what I wanted to say yesterday. When you decided to marry your husband, hopefully, you knew the most important things about him and that helped you to decide to spend the rest of your life with him. You did not know everything there was to know (that would be boring anyway) and may have been a bit disillusioned at times in the beginning. When it comes to the church you have all of the important stuff and even more than most of us who were blessed to have had Her all along. Anyway, I wanted to say, come on in and receive Jesus and then you will be sure! I didn’t have the courage. But then this morning, I read this and once again, thought of your situation. Blessings on your journey. I am praying for you. Life is the Eucharist. Brittany mentions above that she believes that the Eucharist is the Body and Blood of Jesus Christ– well, there’s always Eucharistic Adoration: maybe there’s the option of engaging with Him directly in this manner outside of receiving Him, asking Him her questions, and listening as He speaks? After all, if you believe that the Eucharist is real, then that is Jesus, right here, right now. Love this article, I’m a new Protestant Christian and have been trying to compare the two (My mom’s Roman Catholic). I got the impression that Protestants do believe in works too, though, because they believe that after faith you have to repent – and part of repenting is changing your ways? Beliefs vary, but essentially: Both Catholics and Protestants believe that your faith is what allows you to go to Heaven because of what Christ did on the cross. We cannot earn our salvation. Catholics go on to say that real faith WILL produce good works, and if you don’t have works to prove your faith, you may not make the cut on judgement day. NOT that works save you, but that they are a proof of your faith and a logical, necessary result. Many (not all) Protestants generally believe that you are saved by faith ALONE and that your works have ZERO affect on whether you will go to Heaven or not (though some will agree if you say a prayer and continue to live in sin with no change, you probably aren’t really saved in the first place). I give a more thorough explanation in my post Is Faith Alone Enough? if you want to check it out for all the details and verses. I never knew that Catholics believed in faith alone, actually. Or at least not culturally. At least in South America. What I found interesting is that in all of my mission trips to various parts of South America, when asking people why they thought they should go to heaven, they rarely mentioned Jesus’s sacrifice – it was all about how good of a person they were, how much they tithed, what good deeds they did. I’m eager to read more of what you’ve found! I really enjoyed reading this series — there’s so much of this I wish I could remember at all times for when I am met with questions about faith! 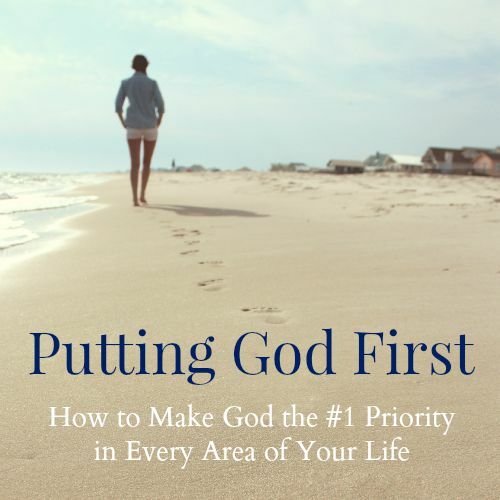 This is going to be a wonderful resource for so many with faith questions. Thank you! I was raised Catholic, fell away in college, and came back far more faithful in my mid twenties (10 years ago). I did a lot of research and reading as well and the conclusion I came to was this… if I believe Jesus is God, then I also must believe that He knew what He was doing when He left the Church in the hands of humans. Of course He must have seen the heresies, the pride, the confusion (even the percentage that we might go off-course to any extent)…but to say that He made a mistake that needed correcting (by Martin Luther or anyone else who thought they knew better than Him in these 30,000 other denominations)…well, I realized that I would be saying I actually didn’t trust Jesus. A Church run by humans will never look perfect, but our doctrine is. If all early Christians believed in this, how am I so above them that I can pick and choose what to believe in? I have many problems with our Church today – disrespect toward the Eucharist by so many Catholics; the hero-worship of saints, bishops, and popes; the unwillingness of so many priests and faithful to stand up for our true beliefs- but they are problems created by humans. The Church, the sacrifice, the history – what the early Church fathers, the martyrs, the Apostles KNEW to be true, to the extent that they would die for it- I must humble myself to believe as well! As far as Marian devotion (as you said, NOT worship), as a mother, I get it so much more now. She said yes to God, raised the only perfect human being in history, and I strive (and do it so, so badly 🙂 ) to be like her. Honestly, I know how long and rambling this is, but as I write it I realize that to be Catholic is to be and NEED everything you have written about. We constantly fail to lives our lives as we should, so we need the Mass, the Eucharist, Confession, to bring us back and keep us on track (like the bells, these sacraments “wake us up” from our self-centeredness and pride). Again, thank you for this and I will also be praying for you! Well, all the sinners in the Church shows us that God works through imperfect people– and if we believe that Jesus is God, we also believe that He can work through imperfect people: I guess this is where belief that Jesus takes away the sins of the world becomes real. If we truly believe that He does, because His One, True Sacrifice isn’t a one-off, one-time event relegated to the past, but perpetuated throughout time and space, then we believe that He can make things right, make all things new, and therefore restore His Church. It’s also why Pope Francis reminding us that the Church is a field hospital is important: the Church is a field hospital for sinners, not a museum or country club for saints. She and her strong medicine, administered by the Divine Physician, makes sinners into saints– provided that they cooperate. One does not judge the efficacy of the field hospital by those who refuse treatment, and anyone who has ever had any experience with Catholic spiritual practice also knows that all sinners struggle with grace, because it demands that we change. We also don’t just become “nicer” or “better” people– we become like Christ; we love like Christ. That’s not easy, so it should not surprise us that that grace sometimes hurts. “If I believe Jesus is God, then I also must believe that He knew what He was doing when He left the Church in the hands of humans.” : That’s a very good point. But even the Israelites (also God’s people) got off track and had to be corrected several, several times. So while I definitely give huge credit to the original religion, I’m still looking into if the Catholic church today is the same as the church of the first century, or if it is just another branch of Christianity, just like all of the other ones. I first want to say that I think you absolutely did the right this by not entering into the Church while still having doubts – I respect you so much for that! For that reason, I almost did not reply to this, because you are correct and until YOU are ready, nothing I can say will change your mind! But you’ve really made me think over the last few days (a great thing about this series). I certainly don’t have all of the answers, and while I would love to have more time to research, I am also a mother to two toddler boys and can only read (and retain) so much! However, I just wanted to say that while God punished the Israelites, He did not take away or send someone to change their religion (okay, well, until Jesus). As far as Catholicism goes, Jesus said that the gates of Hell would not prevail against his church. So how could I believe that Luther and the printing press or King Henry VIII or Joseph Smith or any other man would prevail against it? We’ve had evil popes, heresy after heresy, human confusion — but the Catholic Church outlasted – and continues to outlast – them all. I do go to a Traditional Latin Mass (which is really just the actual mass of Vatican II) and read so much about the faith when I made this change. Our church, especially the new mass in America, doesn’t look much like a first-century religion. But everything you’ve discovered in this series showed me, once again, that the Catholic Church is unchanging – it does not move with the times, as our basic spiritual needs as humans remains the same. We need the sacraments, we NEED the Eucharist (the actual, real Eucharist), we need our priests to guide us in our understanding of the Bible. The effectiveness, the seeming holiness, the outward appearance of the Church have ebbed and flowed over the years, but only because of the humans involved, NOT because the Church needed changing! I do hope this all makes sense – I have two boys waking up from their naps needing me and I rushed a bit. God bless and I am praying for you! This quote is actually explaining apostolic succession, but may help here. This is one of the earliest references to the Church as “Catholic.” And no matter the arguments about what he meant by “catholic” (universal, general, whole), the fact is that how he wrote it shows that even in that time, it was known as the Catholic Church (he didn’t write it as if he were introducing the idea). He wrote this only a few years after St. John the Apostle died, which means this man most likely would be teaching/referring to the same faith as that of the Apostles. Although there is a slight chance that the Church could have moved off track to some degree in the ~10 years since John died, I would say it is more likely that the faith was pretty true to what Jesus left for us at that point. Had the Church gone off to any degree before John died, all of John’s writings would probably be also off track, therefore making the Bible questionable for ALL Christian religions! If you are referring to the Roman Catholic Church/Eastern Orthodox Church split (which isn’t actually a split), it is certainly complex, and I still haven’t read enough to quite follow it yet. But I have learned that the Catholic Church does not actually refer to itself as the “Roman Catholic Church” because that would then exclude the Eastern churches. It has only and ever been known as the Catholic Church, and to go back to my original reply, I would still have to say that I can’t believe that Jesus was wrong. He sees everything, He knows everything. If the church of the Apostles isn’t what He wanted, He would have done something totally different. Could the Catholic Church have gone off 5 degrees? If I believe in the Trinity, I can’t believe that would have happened. Please don’t misunderstand me, I know what a lot of my Protestant friends believe and some of them are so much more faithful, knowledgeable, and better at practicing their religion than many of my Catholic friends! I just believe that when it comes down to it, only one church has Apostolic succession, only one church has the real Eucharist, only one church has the entire Bible, and although certainly every attempt has been (and currently is being) tried to change it, in the end, the Catholic Church remains true and unchanging (and yet is adaptable to the times we are in). It is as simple as saying “I believe in the One, Holy, Catholic, and Apostolic Church,” and as difficult as realizing that you would need a lifetime to find all you would need to truly, truly convince yourself intellectually that it is, in fact, the one true Church – if you ever could. But, that is where faith comes in –believing without seeing – and this is why our Church is universal. I’m sorry, I don’t know why I keep feeling compelled to respond, but you bring up very good questions and I find myself either remembering information I once found or really thinking about WHY I believe what I believe (and it’s very important to me to know the why). Other people have responded so much more eloquently! I think I may actually be writing these responses more for myself. 🙂 Thanks for putting up with me! If you are able, you could read “The One True Church” by Fr. Arnold Damen. I came across it just today as I was looking up the answer to a question that came up in my family this weekend. I’ve never heard of him before, but he was a priest in the mid-1800s, and although it is a long read, he says so much better what I have been trying to express. Also, I’ve been reading the other posts on your blog, and I wanted to thank you for saying so many great things – especially “No, my kindergartener does not need a girlfriend!” As a former Kindergarten teacher and mother of 2 sons, I can totally relate to this! Brittany, I was born into the Catholic faith. However, at the ages of 50 my husband and I are still learning about our religion. that is part of what is so amazing, the deep richness of the Catholic tradition. I wanted to clarify something I have come to understand regarding what the Catholic Church teaches about the Pope and his infallibility. The Pope is only infallible when he states he is speaking infallibly. That has only occurred twice in all of Catholic history and both times regard the Church’s beliefs about Mary the Blessed Virgin. First, she was conceived without sin, and second, she was assumed into heaven. I did not understand this growing up, so I hope this information is helpful. Blessings to you on your journey of faith. Yep! I mentioned that in my post on priests, the pope and confession 🙂 Glad you’re learning more about your faith now! I highly recommend “Rome Sweet Home” by Scott and Kimberly Hahn. Another alternative is to look up “Scott Hahn the tape” on YouTube. Brittany, I’ve been following along quietly and have been praying. You did a wonderful job. I’m not at all surprised by your decision, and am in complete admiration for your honesty, integrity, and respect. I believe you made the right decision. God works differently in all of us. These topics take time to explore and pray about. I remember my reversion vividly. I struggled with morality issues that were deeply ingrained. The Catechism was the book that helped me the most. I was able to read the teachings and then read the supporting scripture and where the teachings came from. There came a point where I was ready to accept everything the Church teaches. My research and prayer for God to show me answers turned into asking Him to help me deepen my relationship with Him. My life was changed (for better) forever. 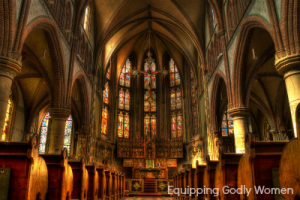 I was transformed and grew closer with Confession, Eucharist and Adoration (not a Sacrament). When they say that faith is a gift, it truly is. I asked for it, and received it. I’ll continue to pray for you as you reconcile your head and your heart! Thanks for the prayers as I sort through everything! I really appreciate it! Hey. I felt much the same way. I mentioned in the (very, very, VERY long) comment (I had meant to make it short) when I returned to the Church. I was Pro-Choice all the way. Go MARRIAGE EQUALITY! It’s just love its not wrong!!! etc. I did now face having to really look at the social opinions I had and then re-examine myself and read up the writings of the church on the matters. And I have less of an issue being pro life than anything else e(saw my sister have one and the utter pain she went through and how scared it has left her emotionally. I couldn’t say it was as great and liberating for her as it seemed.And well, I can’t very well accept what I love so much about the Church and because I’m uncomfy thanks to the society I was born into, I will decide to just chuck out those? Nah. Can’t. Not truly all there if I do that and I may as well be totally gone if I’m not 100% in. Wonderful series, loved the amount of respect in the comments and the information, thoughts, views and so on that were exchanged. I ALSO thing it was good you didn’t rush into anything (I did a year of dicernment as I felt a alling into religious life but though I was a good cadidate I was too ill and health is essential. not much of the more expensive health insurance if I’m a nun. But I know tha I would have followed up wit 2 retreats before even being a a postulate. I will be praying. If you don’t mind I’m goin g over with family from Argentina to Chruch (the younges pries tis a fam. friend from Colombia….And he runs part of RCIA and prayer groups etc. .) I sayask him if he can pray…just for you to find where God truly is leading you. If you end up not joining and instead, say, this all makes you somehow feel stronger about the Protestant faith then I am confident God knows WHY and what you have to offer the world from whatever position it ends up being you take/accept. Amen n Amen… My prayers are with you that THE TRUTH will set you free…. To add to the thought about denominations . under Lordship of CHRIST THE WORD OF GOD… Roman catholiscm is a religion that is under lordship of man over The Word… n from it’s beginning rc was born of human ambition of emperor Constantine to unite his conquered lands …it did not begin with the Mission of Christ which is for the salvation of souls …. Roman Catholicism began with and through Christ, NOT “born of human ambition of emperor Constantine to unite his conquered lands”. The Catholic Church is the Church spoken about in the NT. Jesus did say His Church wouldn’t have the gates of Hell prevail over it, that’s one way of knowing that no matter who the Reformer was he is and was wrong in saying the Catholic Church was totally corrupt, and should be abolished, and have other religions in it’s place, run by anyone with an opinion of what little is written in the NT about the Church, throwing out the reverence that is due the Lord. The 7 Holy Sacraments, the Most Holy Mass, are works spoken of by the Catholics, They are Biblical. Which confuses me as to how you don’t see it or believe it when it’s pointed out to you. They are the works of Salvation, that were always in existence, given to us to have an easier Way to follow the Ways of the Lord. There isn’t a Catholic, who knows the faith, out there that believes they earn Heaven by those works, or anything else, you gain Salvation through Christ, through His works. Your relationship with God only deepens through those works, and God’s varied grace is poured out through those works. His works of the Cross, His Passion, Death and Resurrection, and the works to be done through His Apostles and their successors, are the works of the Faith. Faith without works is dead. What a wonderful and blessed blog! Very thought provoking too. I’m Catholic, although I strayed when I was married. I came back because it’s home, even though it’s hard and has its inconveniences. As a divorcee who was in a relationship, I was excluded from the Sacraments and it was very painful. After being able to canonically marry my sweetheart of 17 years, going back to Confession and Communion has been profoundly and deeply moving. Last year the faithful were asked what they believed would be the right way to handle sticky family situations, and the Bishops went to Rome to discuss it. They will go back next year to see if they can make a decision. Some of them feel that the world has changed, people are living longer and we should show more pastoral sensitivity. Others feel that we don’t have the authority to change the teaching of Christ. I’m with those who feel we can’t change the teaching of Christ, even though the issue caused me much personal pain. That’s what I mean about it being inconvenient. The church doesn’t change with the times, but hopefully acts with love and mercy while still keeping the rules. I couldn’t ever be anything other than Catholic, but if I were to go through RCIA and swear in public that I believed and would hold to all the teachings of the Church, I don’t know if I could. I think that’s where you are? I wish you well on your journey, and I look forward to your new posts. And yes, that’s exactly where I am now. I don’t necessarily disagree with anything in particular (though I do think some things are odd and unnecessary and there are some things I still just don’t know). But the idea of having to publicly declare that I believe it all to be 100% true. I can’t make that commitment at this point. I was divorced in South Africa in 1988 and moved to England in 1997. I met Sean in 1998. My marriage was annulled by the Church because of provable problems at the time of the wedding. Sean was free to marry. But after the South African government changed, so did their court system. Documents and records have been moved around so much it hasn’t been possible to get a copy of my divorce papers. The Church has to obey the law of the land so they could not grant us a sacramental marriage because a legal marriage isn’t possible without divorce papers. I could have gone to Communion if I had given up Sean, but as it’s been the best and most healing relationship of my life, I wouldn’t. But we’ve sneakily found a way around the problem and we are both delighted to be restored to full Communion. We had attended Mass regularly and yearned for it so it feels like a long drink of cold water after a weary journey in a desert. That’s what I’m curious about. How did you get around the problem? My husband and I converted to Catholicism, we were both raised baptist but then like you, experienced discrepancy. God has really changed us and we have grown so much in our faith. We absolutely love being catholic!!! I love that we can trace back the leaders of the church back to Peter who was given the “keys” by Jesus Himself. Every doubt I had was cleared up over the past few years, and I expect more as time goes on bc there is no way I’ll ever be able to go through thousands of years of church history in my short lifetime 😉 step out in faith you won’t regret it! That’s great that you’ve been able to find the answers that you were searching for, and that you actually searched out the answers yourself instead of just taking someone’s word for it! To answer your question, Catholics believe that the Sacrament of Marriage is conferred on one spouse by the other and that the priest and other people are merely witnesses. We told our Parish Priest about it and he congratulated us. We hadn’t wanted to ask him because it would have put him in a difficult position. I think he’s happy about it too, although he can’t officially say so. Interesting… I didn’t know that. I have to ask, if you accept that the Eucharist is real and true, how are you not hungry for it? And to answer your question, in regards to how do we know that the Catholic Church is the Church that has that authority, the answer is simply FAITH! I believe all things you have researched and discussed are pointing you to Catholicism. So, you have to ask yourself if the things that are holding you back are things of the Lord, or things of the world. Okay, I see now after reading closer that you want a chance to read the additional books/ catechism before going through with it. I think that is responsible. But, as you said with infant baptism, why wait? many Christians never get a chance to read the entire bible, but they still accept it as truth without having to read it for themselves. To me this would be similar. If the Eucharist is the true presence of Christ and you believe that, then in my mind, why not have complete faith in the only Church where the true physical presence of Christ is found. As a side note, I think it is interesting that your parish allows your husband to be your sponsor. My husband recently completed RCIA and I was not allowed to sponser him (not that I wanted to). My BIL ended up sponsoring him, which I think was better. Maybe next time around, a nun or elder woman of your parish could sponsor you! But it wouldn’t be a true Eucharist because a priest isn’t consecrating the bread. 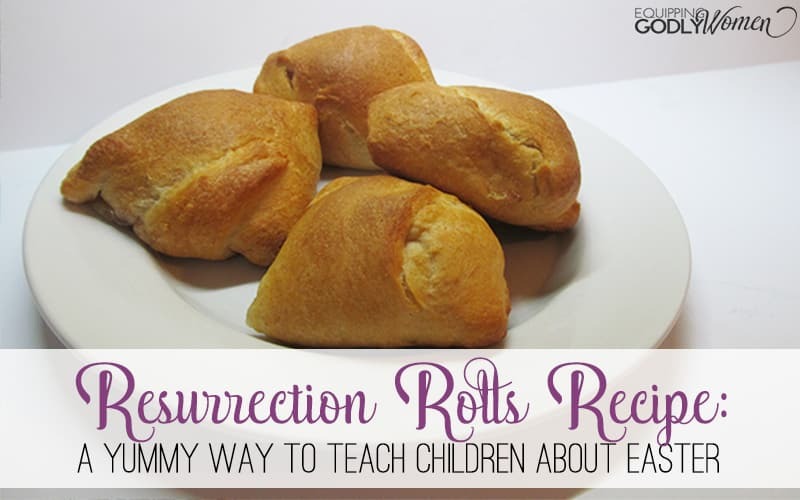 You can’t have just anyone change bread into the body. If the Eucharist is sacred, you would have to be properly educated, trained, mentally sound, and not in a state of sin, to consecrate. If anyone could do it, then his body would likely be everywhere, not sacred, and probably chaotic. I see your point. I am definitely thinking about this as a cradle Catholic. I am not sure why I said that! I just think that once you start reading the catechism, I think you will see that the Church teaches a lot of love and a lot of truth. Some church teachings seem harsh or difficult to follow, but the reality is that God wants what is best for us emotionally, physically and spiritually. The faith is so deep and so rich. It would take a lifetime to fully begin to know everything there is to know about it! Plus, I assume you are raising your children Catholic if you baptized them Catholic. I just think you will find yourself wanting the same things that they will experience in church. RCIA is a process, so I would assume that if you want to go through the Rites, you would have to begin again, at least that is how it is at our parish. 🙂 Blessings to you, I love your blog. Oh, and I was allowed to go to all the classes with my husband when he was in RCIA, but when it came to sponsorship, they told us that a spouse is “too close” to be a sponsor. They want the decisions to go through the rites to be completely your decision, and not decided based off of what your spouse wants. Hi, Erica! I hope you learned a ton. If you have any questions, don’t hesitate to let me know! I write a small Catholic blog as well if you ever want to stop by maybe I can help answer additional questions you have. Thank you for doing this wonderful series! Prayers & God Bless! Still in about the same place… not opposed but not yet convinced. Thanks for the recommendation! Hi there! I just stumbled across your series and have enjoyed reading about your journey. I was born Catholic and for the past 17 years drifted away from my faith. But over the past year I felt an incredible longing to seek God and delve into faith. I attended a non-denominal church with a friend in the beginning of my search, but having grown up in the Catholic church I left the service feeling major parts of the christian faith were missing. Especially the Eucharist. I started to wonder why there are so many denominations within Christianity. I felt even more compelled to seek the truth. After relentless researching and questioning, I have come full circle and everything was pointing toward the Catholic Church. Here’s just a few things I felt affirmed my belief as the Catholic Church being the one true church. There is no other church that history dates back to Jesus and the apostles. All Christian denominations WILL be traced back to the Catholic Church. The beauty of the Catholic mass not only dates back to the New Testament but also the Old Testament and ancient Jewish practice and belief. For example during the celebration of Passover before Christ, The eating of the Passover lamb and unleavened bread accompanied by drinking wine made them spiritual participants of the first Passover night, even though centuries had past since the original Exodus; God’s original act of deliverance was made present in the Passover liturgy. Therefore the first Christians being Jewish Christians, could understand the Eucharist in the Last Supper. That Jesus Body and Blood was the “New” Passover (He is the new lamb). Who is continually present in the Eucharist only in the Catholic Church. There is unity in the Catholic Church all over the world. No matter where you are in the world or what the native language is; all masses are unified by the same readings and rituals. You can walk into any mass and follow along even if it’s not in your native tongue. Christ established his church, and he will certainly not abandon it. Protestant churches are a result of man choosing to seperate from what Jesus himself anointed Peter to build. In my experiences at non- denominational services, I do believe that they are trying to spread the good news, but they are missing very intrigual parts. It makes me question the Protestant movement because what gave them the authority to pick and choose doctrine or remove books from the bible? The Catholic church’s authority stems from St. Peter himself whom Christ appointed. Because the Protestant movement rejected the papal authority it’s result in 30,000 offshoot churches isn’t surprising. I feel that the Protestant movement was a result of man attempting to interpret and change scripture to their liking on their own terms. We can see to this day that that authority has not failed in the Catholic church and its remained firm in its roots and values. I was very surprised this Christmas to find out a lot of the non-denominational churches in my area not having a Christmas Day service. Only Christmas eve. I find that odd, given that Christmas is our savior’s birth. To me, the Catholic church is accountable. No matter what the day, there will ALWAYS be mass and people will gather to worship, praise, give thanks, and be in the presence of God. There is no other church like the Catholic Church. I strongly believe that the fullness of Christianity lies within her. I encourage you to keep searching for the truth. What I found helped me was looking to the very beginning. At our jewish roots and how the beauty of the old testament makes way for the new universal church. I also forgot to add… a great catholic radio station is Immaculate Heart Radio. Check out their app for smart phones or you can stream the radio online. I want to thank you (so much) for this entire series. I grew up in the Catholic faith but never did the adequate research to understand it. As an adult, I stopped attending church and wasn’t confident in what I believed anymore. This past December, I decided to start reading the bible. That dedication and this series has really opened my eyes. I appreciate you taking the time to share your journey. It’s been so helpful for me! I came across your website while I was searching for misconceptions about Catholicism. The purpose of my search was to prepare for an upcoming RCIA lesson at my local parish. Many people have mistaken ideas about what the Catholic Church teaches, and I am preparing our recent converts to be aware of some of the allegations they might encounter from family, friends, and coworkers. I wish more people would examine the facts as you have instead of just believing anything they read or hear (often from dubious sources). Your story was an encouragement to me because sometimes I get very frustrated when people don’t investigate things to determine why they believe what they do. The lady I currently teach with joined the Catholic Church after five years of research that started when her daughter announced that she was seriously considering the possibility of leave the Baptist Church for a local Pentecostal Church. She initially set out to prove that the Baptist Church was the true church, and that the Pentecostal Church was wrong. The Catholic Church was not even on her radar at the beginning because she had been predisposed to believe it was a false Christian cult. Little did she realize where her research would take her. What I find especially powerful is the conversion stories and the discussion forum. You and/or your readers might find this website useful. If you need any assistance with your journey I would be glad to help. May the grace of the Lord Jesus Christ and the love of God and the fellowship of the holy Spirit be with you and your family. Brittany, I just stumbled upon your blog today and binge read about half of this series! Brava!!! I am so impressed by your open mindedness, your desire to learn and your in-depth reading and research to that end. I myself am a lifelong Catholic, still learning more about the Church as I go, and always striving to be closer to Jesus. I have many Protestant friends whom I love dearly! It is *never* my project to convert them, but it’s always my prayer 🙂 So many of your posts sound like conversations I’ve had! I can’t wait to share this series with friends. Just came across you blog. Quite interesting and I learns from it. As a catholic, I respect your stand on being neutral, open to any fact, and not emotionally jump into becoming a catholic. lol, That’s my plan! Thanks for sharing. I have not read all of the comments so forgive me if I am bringing up something that has already been addressed. If you have researched the history of the Church fully, then you would know that there was only one Church, ever and it was the one which had Apostolic Succession. Jesus only created one Church so as there was only one until Luther went crazy, it has to be the Catholic Church. That is just common sense. Now, if you want to know if the Church today is the same, please prayerfully read St. Clement and St. Ignatius of Antioch. Read St. Justin Martyr and the Didache. All of these sources will reveal the same Church, the same Mass, the same Hierarchy that we see today in the Catholic Church. As someone who was confirmed at the age of 52, I can tell you that Jesus is present in the Eucharist and one of the greatest regrets of my life, is that I did not know that, and I lost all those years of unity with the Lord and the grace that comes with that and all the other Sacraments. Keep going backwards and then go forward. Come home to the only Church with the fullness of Truth. Come and taste the sweetness of the Lord. Yes, I definitely need to find some time to read the early church fathers. I’ve been meaning to, but just haven’t gotten around to it. Perhaps THAT should be my New Year’s Resolution this year! Hmmm….. food for thought. I just found your series through a post on Pinterest. I was raised in the Catholic Church, attended various churches as a young adult (both Catholic and Protestant, because my opinion is very similar to yours – who cares? we’re all Christian) and am now in a ‘Calvinist’/ Reformed church. Truthfully, I only read your first article and last, because I didn’t want to be any more confused than I’ve been in the past and I could see you were leaning toward Catholicism (whereas I’ve leaned away). I’m happy with Bible Study Fellowship, and my church and I just wanted to say that I appreciated your style of writing – straight to the point, with little grammatical or spelling errors 🙂 and I especially appreciated your acknowledgment that we are all Christians. No ‘conversion’ within Christianity needed. 🙂 Many blessings on your sincere journey. Hey, Becky! You should totally go back and read all the posts! 🙂 Spoiler alert – I didn’t actually end of converting, but I did learn a TON along the way. I really don’t think the posts would confuse you – just share some more information you would probably find really helpful in making your decision, whichever way you decide. 🙂 Glad you enjoyed what you’ve read so far though!